Saturday, January 31, 2009 is the last day to order the Valentine's bundle at 20% off! CLICK HERE for more info and let me know if I can assist you in ordering your bundle today! It has taken me a little time to post and get back to my blog! I saw a post on SUDSOL for blog designs. So I emailed Julie and we got to talking and the next think I know...she has designed this beautiful new look on my blog! I told her I love purple and I GOT PURPLE! Julie was wonderful and I talked her into putting her button on my blog! Make sure you take a look at Sonomes Designs and she what she can do for you! THANK YOU SO MUCH JULIE! I OWE YOU ONE! Super Bowl Mystery Hostess Event! New Idea Book and Catalog is HERE! You are invited to participate in my Super Bowl Mystery Hostess Event! You could receive the entire benefits of hosting an in-home party just by placing an order on Super Bowl Sunday! If you call, please leave a message with your order or with your number and the time you called, I will get back to you. 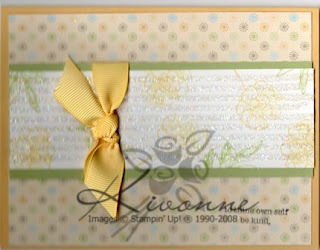 With every $50 ordered, you receive a specially designed stamp set, ribbon bundle, or designer series paper pack for FREE. Please choose from the six products in the Sale-a-Bration catalog. Each item is valued at about $17.95, but you will receive it for FREE! Don't have a catalog? Now you can view it on line. Go to www.stampinup.com click "on line catalog". Choose from the main idea book and Sale-a-Bration catalogs. Order during the Super Bowl and get all of the above plus the specials listed below. Please remember that when you call or email, to let me know what quarter it is when you placed your order. · 2nd Quarter – FREE box of Glue Dots with a $50 or more order. · 3rd Quarter - FREE Hemp Twine (Red, Natural or Black) with a $30 or more order! · 4th Quarter - FREE Stampin' Dimensionals with a $25 or more order! Thanks for playing and let the game begin! These specials are only available through Kivonne Tucker on February 1, 2009. SAB is coming out on Sunday! I am so excited. This is a great time for you to earn free stamps or supplies. You can select any one of the items in the SAB brochure free with a purchase of $50. There is no limit! Don't miss the opportunity to own these exclusive products. This is a card I made for an SAB swap.